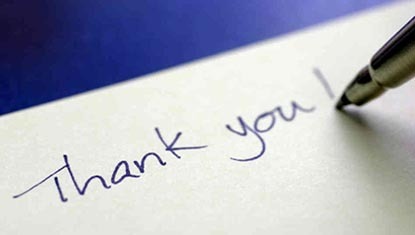 3D Design Bureau | The Two Most Powerful Words In Business - Thank You! All of us have certain pet hates in life ranging from your better half not putting the toilet seat down to being in a restaurant and not being able to get the waiters or waitresses attention. However it’s safe to say that we all hate it when someone, who you have just done a good deed for, doesn’t utter the two most powerful words in the world, Thank You. These two simple words when used, or more importantly when NOT used, can leave an everlasting impression on you or the person you have or should have said them to. But how important is it in business and does it affect your opinion and relationship with clients? It certainly is a tricky question to answer, especially as clients who don’t appreciate your work but give you the business are the ones helping your business. So often in business the phrase ‘eaten bread is soon forgotten’ can be associated with projects that you work on and if all you get during a project are demands with little to no thanks are you going to go that extra mile? Can being too nice get you no where? We will give you a perfect example. Client No.1: Late last year we worked on a relatively small Architectural Visualisation project for a new client. As with all new and existing clients we spent time at beginning of the project trying to understand their requirements and establish what their expectations were. From what looked like a large scale project to begin with, our discussions led to a scaled down version after we advised the client that it was not necessary to go to such extremes. While to some this may appear to be doing ourselves out of business we were looking at the bigger picture and not trying to make a quick buck. We also believe in advising our clients honestly and to best suit their needs. The project went off without a hitch but throughout the process we experienced a lot of demands and very little in return. Not only had we saved the client a couple of thousand euros from the outset but our work has since helped them secure planning and will go on to make them plenty of profit. However following the issue of our work all communication ceased. Not an email or phone call was received following the issue of our work and the absence of a simple Thank You for the hard work we put in was duly noted. Client No.2: Compare this to a more recent and much larger scale project we are working on. Not only is our client extremely appreciative of the work we have been doing but they have been very conscious to make it known to the main client of the project and they are already actively looking to secure another project before this one is complete. We have received numerous Thank You’s through email and phone calls and despite the project being very intensive throughout, we have made sure to go above and beyond to deliver. Two very contrasting experiences that are sure to have an effect on future projects. Whether we like it or not we are all human and despite our best interests to treat all clients equally it would be naïve to say that these two very different experiences won’t have an effect on future projects from either client. Whilst we will have no problem working again with the first client described above we will certainly be going that extra mile for the second client, where hard work was acknowledge and very much appreciated. Oh and not to forget payment being made without a fuss. And whether you know it or not, more importantly in monetary terms this ‘appreciation’ could inadvertently lead to the supplier delivering anything up to 10% more on a project and all because of two simple words…. Thank You!